Table courtesy of Singapore National Environment Agency. As part of the National Environment Agency’s (NEA) on-going efforts to further improve Singapore’s ambient air quality and safeguard public health, the NEA announced that it will regulate additional fuel quality parameters and fuel additives effective 1 July 2019. Singapore’s National Environment Agency will introduce limits for methanol, methylcyclopentadienyl manganese tricarbonyl (MMT), phosphorus and fatty acid methyl ester (FAME) additives in petrol and diesel fuel. These additives, if added into petrol and diesel fuel, have negative effects on the environment and public health, the National Environment Agency said. Methanol produces toxic substances such as formaldehyde, which is a carcinogen, while manganese and phosphorous damage catalytic converters in petrol vehicles leading to higher emissions over time. FAME/biodiesel may increase the emission of nitrogen oxides (NOx) from diesel vehicles, and NOx increases the risk of respiratory infection in humans and reacts with other compounds to form ozone. The National Environment Agency regularly reviews and tightens vehicular emission standards, as well as fuel quality standards for automotive use, under the Environmental Protection and Management (Vehicular Emission) Regulations. 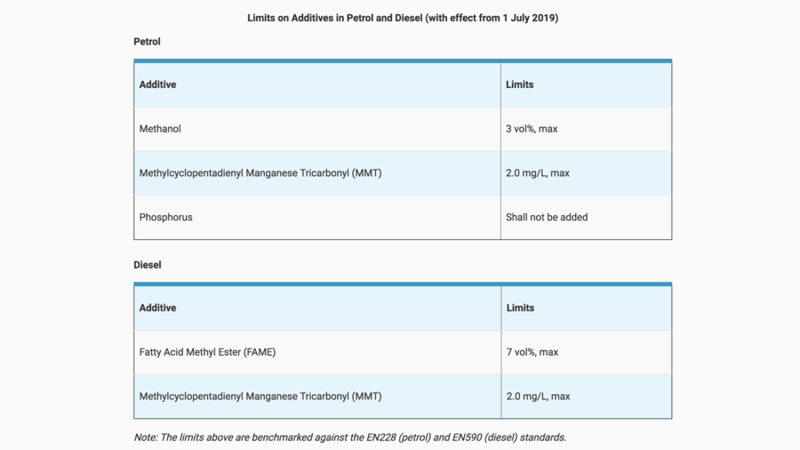 From 1 July 2019, all petrol and diesel fuel sold at petrol stations and other authorised outlets in Singapore will have to comply with the new limits (see charts).